With the number of tourists visiting Irish shores estimated to rise by about a fifth over the next five years, Fáilte Ireland has undertaken a study of hotel room capacity in some of the country's major cities outside Dublin. And, the tourism body's assessment of Cork, Galway, and Kilkenny suggests a significant overall gap between new hotel rooms coming on stream and likely demand for these rooms. Chief executive of Fáilte Ireland Paul Kelly said the report "takes a look at the pipeline development of hotel rooms over the next five years. "We've done this in Dublin over the last number of years and because of the spread of tourism around the country increasing and great growth coming outside of Dublin, we are now looking at other areas." The report highlights that the biggest squeeze is in Kilkenny, where 41 new rooms are likely to come on stream by 2022 to add to the current supply. On the situation in Kilkenny, Mr Kelly said: "Only about a 4% increase is what's currently in the pipeline, so we believe there is significant opportunity for the private sector to invest and to develop further hotel stock in Kilkenny. "There is a tremendous tourism offering that's already there, it's getting better all the time, we're investing, the local are investing, and it's becoming a more and more popular tourism destination." The Fáilte Ireland CEO said it is calling on a "combination of all" types of investor to get involved in the hotel sector. "There are two fundamental ways to increase the number of hotel bedrooms. You can extend existing hotels or you can build new hotels. "We're signalling this to all of the existing operators that are in the market, we're signalling it to landowners who may have suitable sites in the area, we're signalling it to property developers who can buy those sites - so to the entire market really." Mr Kelly said there is already significant investment in the pipeline for both Dublin and Cork when it comes to new hotel rooms. Galway, which is currently at 82% annual occupancy, also has significant room for investment. 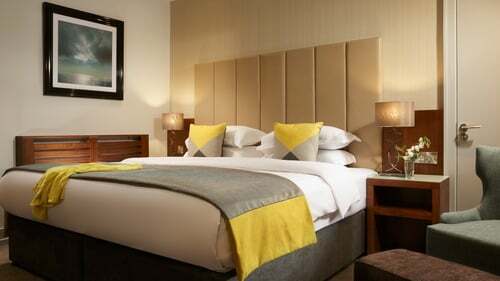 With an estimated 17% increase in hotel bed stock over the next five years (500 new hotel rooms), this growth is likely to fall short of expected demand, according to Fáilte Ireland. For Cork, Mr Kelly says there is "a very healthy pipeline of development. "Cork is coming from a little bit behind probably where it should be in terms of hotel stock but it's great to see there's about a 35% increase due in the pipeline in the next five years and that will be needed." This 35% rise equates to over 920 new hotel rooms in Cork by 2022. On the impact Government plans to crack down on Airbnb lettings might have on hotel room demand, Mr Kelly said: "We're still working through the exact implications of this for tourism. "It seems from the information we've been able to get so far, the vast majority of the stock that's available through Airbnb is less than the 90 days and the vast majority is people who are renting out a room in their house." He added: "From what we've seen so far it doesn't look like it will have a major effect" on hotel room supply". However, he added "one of the big concerns in that area is that we need to make sure that the long-established self-catering sector of the Irish tourism economy in rural Ireland that can support hotels does not get inadvertently hit by these new regulations".